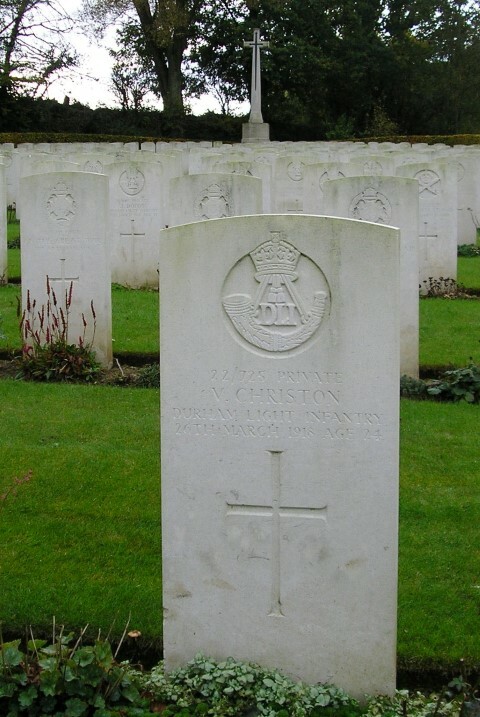 221725 Private Victor Christon, 22nd Battalion, the Durham Light Infantry was killed in action 26 March 1918 and is buried in Pargny British Cemetery, Belgium France. He was 24 years old and is commemorated on Cockfield War Memorial. In 1891, the family lived at Cockfield and in 1901 at Main Street and in 1911 no specific address is given. His father Robert worked as a shoemaker then a boot repairer. Victor worked as a butcher. October 1916 and 22/DLI was ordered back to the Somme, repairing roads. Then orders came that the 8th Division would attack German trenches at Le Transloy, 23 October 1916. A Company was to work as stretcher bearers and heavy casualties were expected. B Company was involved from 22 to 25 October, digging assembly trenches and 23 October commenced digging a communication trench. Whilst doing so a heavy enemy bombardment lasting 2½ hours resulted in about 10 casualties. The assault was to be renewed 0350 next morning 24 October and a party of men from B Company went over the top with the second wave to dig a trench on the right of the sector. At 07.00 orders were received to withdraw and B Company was ordered out of the line. C Company went over the top at 1930 hours 22 October and was subject to a heavy barrage, 5 men were killed and 14 wounded. D Company left their billets 1630, 23 October but their guide got lost and their action seems to have fraught with problems. Between 22 and 27 October 22/DLI lost 2 officers and 26 other ranks killed in action or died of wounds, 1 officer and 21 ORs being killed 23 October 1916. Private Victor Christon was wounded in action 23 October – GSW (gunshot wound) left arm (flesh) and was treated at No.14 Casualty Clearing Post (CCP) then No. 48 Casualty Clearing Station. He received attention at Etaples (35 OC?) before he re-joined battalion 26 November 1916. 22/929 Private N.W. Chambers served in B Company and was wounded 23 October 1917 before succumbing to his wounds 26 October 1917. He is buried at grove Town Cemetery, Meaulte. The 8th Division was to attack the German positions east and north-east of Bouchavesnes, north-west of Rancourt, 4 March 1917. As usual it was the task of the Pioneers, 22/DLI to dig communication trenches across No-Man’s Land. Losses to 22/DLI were 14 killed and 28 wounded. Private V. Christon was unscathed but was wounded in action a second time (GSW chest) about 14 March 1917. He was admitted to 48 CCS. Sheen confirms that there were casualties 12 and 13 March before the enemy withdrew from these trenches. Private V. Christon re-joined battalion April 1917. By 23 March, 22/DLI was in billets at Rosieres in reserve then was ordered to take over the line from the harassed 50th (Northumbrian) Division. They marched through the villages of Chaulnes, Fresnes, Marchelpot, Omiecourt and Pertain. A Company initially formed the line west of Morchain then retired 500 yards to a position near Potte Wood. B Company was also in this area. C Company was in reserve. The Germans launched a mass attack with artillery and infantry in the morning of 25 March. 22/DLI retired to Omiecourt then, fighting all the way, the battalion was ordered to retreat to Chaulnes which was reached by evening. At dawn 26 March, the battalion withdrew to Lihons then by the evening it was beyond Rosieres in the Divisional Reserve. By noon, 27 March the enemy pressed towards Proyart and the position was critical. 22/DLI moved towards Harbonnieres looking to counter attack with the 2/Devons and the Germans were driven back towards Proyart. But the position could not be held for long and on the morning 28 March the whole line of the 8th Division was in danger from the north and south. There were an estimated 400 casualties in the 3 days since leaving Ypres. The Division was pursued back to Caix, Cottenchy and Moreuil Wood before being relieved by French troops 2 April. 23 officers and 469 other ranks had been killed, wounded or were missing. Between 21 March and 4 April 1918, 22/DLI lost 6 officers and 133 other ranks killed or died of wounds including 22/725 Private V. Christon 26 March 1918, killed in action 26 March 1918. 22/725 Private V. Christon was awarded the British War and Victory medals. 22/275 Private V. Christon is buried at grave reference IV.D.25, Pargny British Cemetery. Commonwealth War Graves Commission Norman Chambers was a school master at Cockfield School.